force driving the gun to the rear while the bolt is locked is near 22,000 pounds. This force is so large that it would be impractical to attempt to hold the barrel in a rigid mounting. The time at which the projectile passes the gas port in the barrel will depend on the location of the port. Ordinarily, this will occur from 0.001 to 0.002 second after ignition of the propcllanl. As soon as the projectile passes the port, the powder gases will start to flow into the cylinder and start to apply a pressure to the piston, thus driving the piston to the rear. The action of the piston is controlled in the design so that the bolt is not unlocked immediately but unlocking is delayed until the pressure in the barrel has dropped to a safe operating limit, 0.001 or 0.002 second after the projcctile leaves the muzzle (fig. 3-(SB). After unlocking occurs, the residual pressure (which has still not reached zero) continues to exert a force on the piston and also creates a blowback action on the cartridge case. Shortly after the instant of unlocking, the piston strikes the bolt, so that the kinetic energy stored in the piston is transferred, thus imparting a high acceleration to the bolt (fig. 3-6C}. After the piston has acted, the barrel and barrel extension assembly strikes a buffer stop which absorbs whatever recoil energy was not previously absorbed by the barrel return spring. 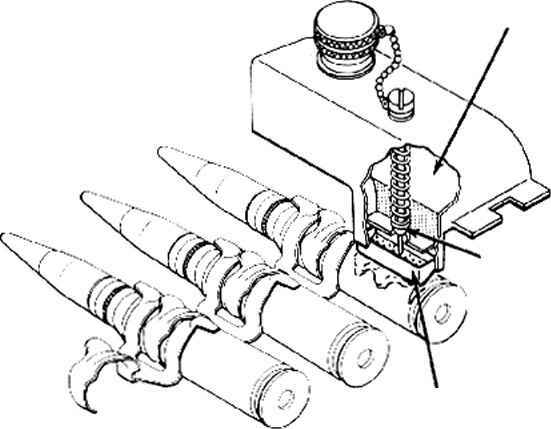 When the barrel and barrel extension assembly has been stopped, it is immediately driven forward by the compressed barrel return spring, and is brought to rest at the battery position by the counter-recoil buffer.